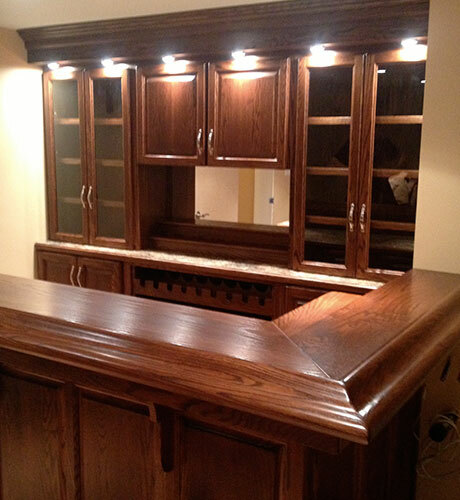 Custom Cabinetry - Joe Coholic Custom Furniture Ltd. When it comes to cabinets and case-goods, our product is made to a much higher quality standard than most. All cabinetry is based upon grooved and dado construction which is glued together – not relying on screws or nails. Whether it is European style frameless construction, or traditional face frame cabinetry – the foundation of our cabinets is the same: a high quality box made from industrial grade materials, built to remain strong and true over many years. Face frames are grooved and glued on, with mortise and tenon joints. We only make cabinets with full backs that are set in and glued, and full tops – for the ultimate in strength and long term durability. We will work in whatever materials you require (any type of wood veneers & core materials) as well as man-made products such as melamine and other materials. Our wooden cabinets are finished inside and out with a high quality, industrial lacquer – which is easy to clean, durable and water & stain resistant. Any type of finish is possible, from natural to any color of stain, to an unlimited choice of solid color finishes in various sheens. Interior shelving and drawers are made to match the cabinets – with solid wood, dovetailed drawers and the latest high end slides, to all metal shelf adjustments, and only the best in hinges.